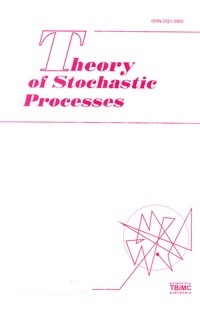 Theory of Stochastic Processes is a semi-annual journal publishing original articles and surveys on modern topic of the theory of stochastic processes and papers devoted to its applications to physics, biology, economics, computer sciences and engineering. All papers submitted for publication are peer-reviewed and, after publication, are refereed at Mathematical Reviews, Scopus, Zentralblatt and Math-Net.Ru. Frequency. One volume per year consisting of two issues with about 100-150 pages each.